Can anyone explain to me where all the ID numbers may be hideen on a 74 Pantera. I know of the door jam and windshield, are there any other 'hidden' chassis identifiers? The thing is I don't appear to have the standard Windshield VIN plate, which in itself is posing some issues with local DMV in obtaining a new title. From the dash it doesn't look like there ever was one, is that common? could #7024 have been a European import at some time or did all Panteras have a Windshield VIN? There's one in the front boot, beneath the black felt, above the driver's foot box. I can snap a photo later tonight if it will help, I'm at work right now. There's at least one other spot, but I'm having another senior moment. All US deliveries had the dash mounted VIN tag, it's the law. The European cars are identified by gages calibrated in European units, such as the speedo marked in KPH. 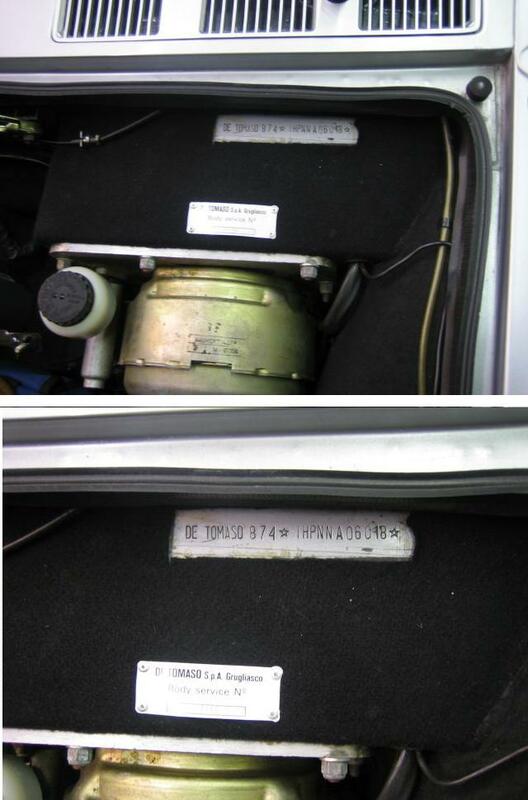 here's the photo of the location of the hidden VIN above the drivers foot box. I cut away the carpet and found it! Just gotta take the car down and show it to my local DMV inspector and I'm hoping I can get a title. Thanks for taking the effort to photograph it for me, I appreciate it. Marlin - That is an excellent piece of info! This Vin looks a little bit self made, doesn't it? Roland, perhaps the pic isn't good enough, but if you were to see the car close up, you could distinguish that the numbers were stamped into the body before any of the oem paint had been applied. Good luck at the DMV. You're welcome my friend, glad I could help. Now Marlin, you know I'm gonna pull my headlights!! Just so I can see those digits! Charles Melton wrote a three page article on the subject of VIN and ID plates, complete with photos, in the winter 2003 edition of PI Magazine (issue #117).